Heritage Hills in Lone Tree, Colorado is a gated, luxury home community with beautiful mountain views, views of downtown Denver, and a sense of nature and the outdoors. There’s an open space preserve featuring wetlands and a natural habitat. Willow Creek and its nature trail are great for walking, jogging or biking. Neighborhood amenities include two private recreation centers, tennis courts, Junior-Olympic size swimming pools, wading pools for toddlers, basketball courts, a mini soccer field and playground equipment for kids. All this makes Heritage Hills one of the best neighborhoods in Lone Tree. Quaint brick and stucco walls wrap around the neighborhood and blend into the natural looking landscape. The walking and jogging trails and a concrete perimeter path tie into the metro-wide system of bike trails. Heritage Hills offers a wide array of shopping, including the renowned Park Meadows Mall, all within three to five minutes away. Soon residents can walk or bike across the Leaf Bridge for breakfast at Snooze, to the beautiful new library or other RidgeGate shopping. If you are a runner, the bridge gives you access to wonderful running trails through and south of RidgeGate including the Bluffs Regional Park. The Bluffs is a 253-acre regional park offering great views of the Colorado Front Range mountains, the Denver metro area, and grassland vegetation and wildlife. From the Bluffs Park trails there are connections to Highlands Ranch trails, the East/West Regional Trail, and South Suburban Parks and Recreation District’s trail system. Heritage Hills is located in the quality Douglas County School District. The 17 acre Lone Tree Elementary School, pending availability, and park site are on the southern border of Heritage Hills. Heritage Hills is a Celebrity Community with Celebrity Custom Homes being the predominant builder. There are several other pre-approved custom builders as well. 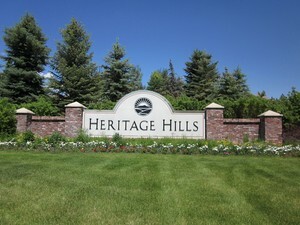 For more information on living in Heritage Hills, go the the Heritage Hills Blog. What's My Enclave Patio Home Worth? What's For Sale in the Enclave? What's My Heritage Hills Home Worth?